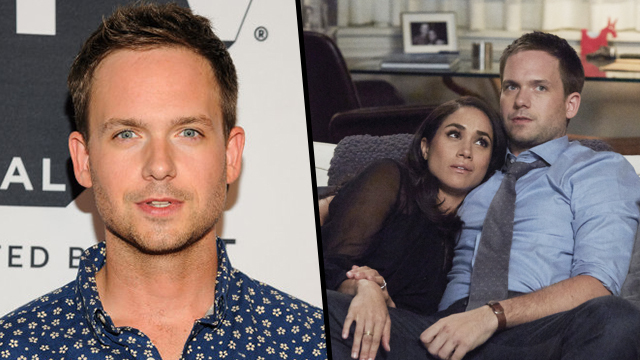 Meghan Markle’s former on-screen husband Patrick J Adams has been using the royal wedding to the maximum for banter purposes, and the world can’t get enough. Initially Adams, who plays character Mike Ross, took to Twitter to post tongue-in-cheek response to the news of their engagement, quoting Kensington Palace’s announcement and saying ‘She said she was just going out to get some milk…’. In the run-up to the big day, Adams has left us beautiful breadcrumbs of fake bitterness, the most recent of which was an Instagram post of The Times front page with a caption reading ‘I’m beginning to think she might not actually be out getting milk #royalwedding’. Woven in between the endearing ‘heartbreak’ at losing his TV wife, Adams also posted a touching coincidence relating to Harry and Meghan’s wedding. If all this wasn’t enough for Adams to warm the cockles of British hearts, as soon as he touched down in the UK, he headed straight to the pub. Patrick and his wife, Troian Bellisario, headed for The Royal Standard of England in Buckinghamshire. It’s been there for more than 900 years and is still churning out pints like there’s no tomorrow. The Canadian actor posted a photo of the pub and captioned it ‘I have historically ale’d’. Several other Suits cast members have landed in the UK this week. Sarah Rafferty, who portrays Donna Paulsen, was spotted sightseeing in London while Gabriel Macht and wife Jacinda Barrett have also been taking in the countryside prior to the wedding. I sort of had a decision to make because I didn’t want to intrude and ask her, ‘Hey, what’s going on? What are you going to do?’ So… collectively the writers, we decided to take a gamble that these two people are in love and it’s going to work out. What we decided to do was as the season progresses say, ‘Look, I would rather have good things happen to Meghan in her life’—which would likely mean her leaving the show. So let’s plan on that and it’s much easier to undo that, if it came to it, than to just plan on her staying forever and then finding out she’s going to go. And the only way to write a character out like that would be if they got hit by a bus or something. It’s a new chapter, right? And also, keep in mind, I’ve been working on [ Suits ] for seven years. We were very, very fortunate to have that sort of longevity on a series… I’ve ticked this box, and I feel very proud of the work I’ve done there, and now it’s time to work with [Harry] as a team. However – and this is where things get confusing – Meghan won’t actually be known officially as Princess Meghan. Only those born into the family – like Princess Charlotte – get this official title. Queen Elizabeth II will most likely dish out a dukedom to Prince Harry, much like she did for his older brother the Duke of Cambridge after he tied the knot. Prince Harry will be given the title of Duke of Sussex, with Meghan therefore becoming the Duchess of Sussex.